Chantelle, Jeff, and all our friends at Banff Lodging Company want you to come out and enjoy "Canada's Protected Playground", also known as their backyard! With an extra 25% off, how can you turn them down! Choose from popular Banff hotels like Banff Caribou Lodge & Spa, Fox Hotel & Suites, Ptarmigan Inn, and the brand new Moose Hotel & Suites. 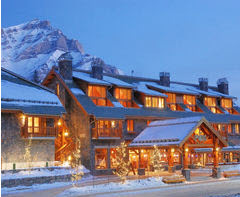 All located within Banff National Park - just minutes from downtown Banff, Alberta, Canada. Take 25% off your stay. A 4-night minimum stay required for some properties/unit types. Don't miss this opportunity to save on ALL of the best addresses in downtown Banff. No skier's/boarder's list is complete without a visit to this jewel of the Canadian west! You will also note the ridiculously limited number of blackout dates, so get your stay booked now!